As the children get older and start attending school (elementary or preschool) holiday teachers gifts are something we love to make and buy. Teachers are a very important part of our lives, they help mold our children into the adults they will someday be. I want them to know how important they are to not only my children, but to our family as a whole. Homemade gifts, along with a gift card to their favorite coffee shop or café are a pretty standard gift for our family to give. 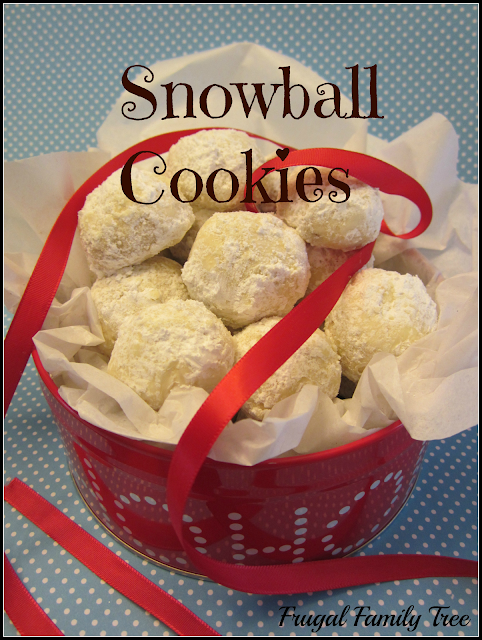 This year we made Snowball Cookies for the teachers and they were a huge hit! The boys helped out by rolling the dough in the "snow", it ended up everywhere but at least they had fun! Preheat oven to 350 degrees. In a bowl, mix butter on medium speed until creamy. Blend in 2/3 cup powdered sugar and salt, mix in vanilla. Sprinkle in cornstarch. Mix again on low speed, slowly add in flour to the mix until combined. Stir in pecans. Roll dough into balls (about 1 Tbs in size) then place balls on lined baking sheet. Bake in preheated oven for 16 - 18 minutes, until bottom edges are lightly golden. These cookies are meant to be a bit dry so do not undercook. Remove from oven and allow them to cool for several minutes. While cookies are still warm, pour 2 cups powdered sugar into a bowl and roll cookies in the sugar. Transfer to a wire rack to cool. Once cookies are cool, generously roll and coat in powdered sugar again and again until they look like "snowballs." Arrange cookies in a cute holiday container or box.